The ID@Xbox team is made up of a lot of talented, passionate people, and today we’re glad to focus in on the person who’s driving this ship. Actually, we’re not sure if it’s a ship, or a truck, or a fancy sports car—but someone’s definitely driving it! 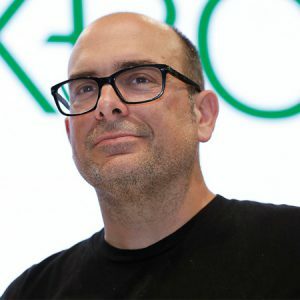 Let’s get to know Chris Charla, our fearless leader & ID@Xbox’s director! I’m kind of living my life-long dream by working in the game industry, doing something really fun and working with developers! Green and yellow, Go A’s! Based on my desk: Chaotic Good. I really like racing games and adventure games. I like exploration a ton. I also really, really, like dungeon crawling! I like JRPGs too. Mostly old-school punk rock from the East Bay (Operation Ivy, Green Day, Crimpshrine, MTX, AFI, etc.) But I like to mix that up with old-school punk rock from San Francisco and LA. I also like Tacocat. I like reading old pulp mystery and noir novels, also sci fi. I hate dark movies, but I really enjoy grim, dark books, so I’ve been reading a lot of Scandinavian crime fiction lately. I just finished the Martin Beck series which was the ’70s series that kind of kicked off the whole genre and it was pretty sweet. I also read a metric ton of magazines. I love magazines and I will read any magazine I can get my hands on. I really dig a magazine called Shock Cinema which is about B-movies. The design is great and the writers treat the subject matter with so much respect, that the interviews with the actors and actresses they do are fascinating, even if you’ve never seen the movies they talk about! I also read Maximum RocknRoll regularly and a lot of skateboard magazines. My favorites there are Bored Zine and The Skate Witches, which are two Seattle zines, but I get Thrasher and Transworld too. Obviously I read OXM but I also like Game Informer, GamesTM, and Edge, and Retro Gamer. There’s a cool Nintendo magazine NF that I subscribe to, and I try to pick up any video game fanzine I see. My favorites comics right now are Daredevil and Kill or Be Killed. I definitely prefer Marvel to DC for superhero stuff, but I read a lot of indie comics too. I like to read, like, a lot! I make a dumb, joke, skateboard fanzine on an Apple II with an ImageWriter dot-matrix printer. I also used to make a game zine called Incredibly Strange Games but it’s on hiatus right now! I really enjoy root vegetables. Beets, carrots, parsnips, etc. If it grows in the ground, I’m probably down with it!